Beautiful bride Lucy married the love of her life in July last year in a relaxed ceremony with an English country garden feel. 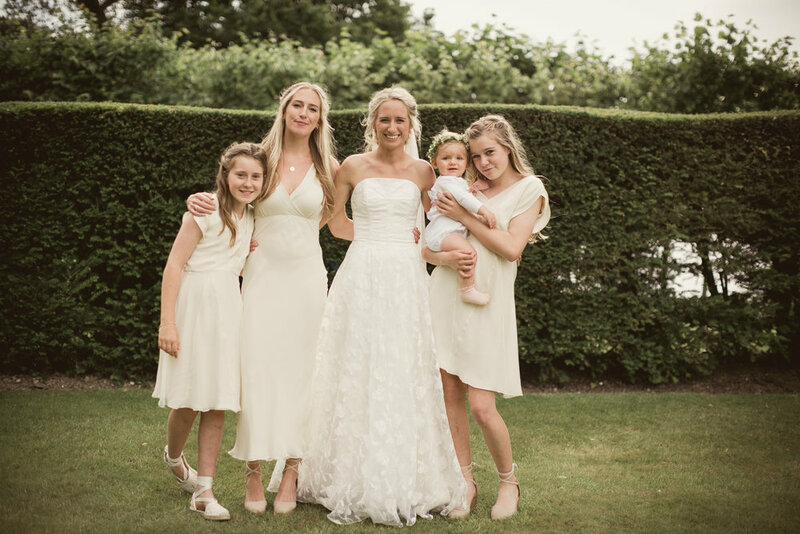 We're so thrilled to have made Lucy's dream wedding dress, especially since she always knew she wanted a Halfpenny London gown so we had a lot to live up to! "I had presumed two things about wedding dress shopping – one, that it might be intimidating, and two, that people in wedding dress shops would just tell you you look good in everything… But I was wrong on both counts! Halfpenny London is the most relaxing and lovely place. And although I wanted to try on every single dress, Jean was amazingly helpful and helped me see very quickly which styles suited me. It could have been quite overwhelming, but she was wonderful." Lucy chose our beautifully embroidered, strapless Esme dress and everyone agreed it was the perfect choice for her. "It's the dress I would have designed myself if I had anywhere near the skill or imagination to be able to do so! On my wedding day everyone said they couldn’t imagine me in any other dress. One friend looked on the Halfpenny website before I got married, and said, ‘obviously that’s the one you’ve gone for isn’t it?’ It’s just very me. I tried to imagine wearing another dress on the day and couldn’t. I knew if I went for something else I would always think about this dress." Thank you for sharing your gorgeous wedding pictures with us Lucy. We're so happy we were able to be a part of your special day. Congratulations from the Halfpenny team!